The National Hockey League entered its fourth work stoppage in 20 years after the collective bargaining agreement quietly expired at midnight on Saturday and the NHL locked out its players. When the moment of truth arrived, the NHL and NHL Players' Association were nowhere near the bargaining table. "We spoke again today, and in light of the fact that neither party has indicated an intention to move off of its last proposal, we have decided that there is no point in convening a formal bargaining session," NHL deputy commissioner Bill Daly told The Canadian Press in an email. "We will keep in close contact in the coming days and if anything changes, I am sure we will be in touch." Steve Fehr, the NHLPA's special counsel, claimed the union requested a meeting before the "owners' self-imposed deadline" on Saturday but was rebuffed. "[Executive director] Don Fehr, myself and several players on the negotiating committee were in [New York] and prepared to meet," he said in a statement. 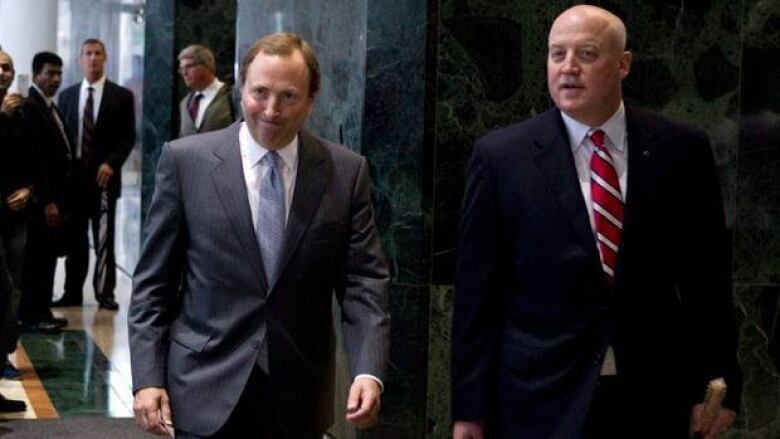 "The NHL said that it saw no purpose in having a formal meeting. There have been and continue to be private, informal discussions between representatives of both sides." During the lockout that wiped out the entire 2004-05 season, both the league and individual teams decided to lay off employees. On Saturday afternoon, Daly said the NHL has no plans to cut staff "at this point in time." Players aren't scheduled to receive the first of 13 NHL paycheques this season until Oct. 15 — something they'll miss if the lockout extends past that date. There are no immediate plans for them to receive a stipend from the union. "Hockey is poised, I think, to really move over the next three or four years to a fundamentally different place than it's been before," said Fehr. "The question is whether the dispute we're currently having is going to screw that up. If so, that's bad and that's unfortunate — we ought to be doing what we can to avoid it." Added Bettman: "Even a brief lockout will cost more in lost revenue and wages than making a deal we think we need to make." For the last several weeks, all of the secondary issues have been pushed aside so that talks could focus solely on the league's core economic system. The NHL believes too much money is being paid out in salaries and has proposed a system to address it. They're calling for the players' share in revenue to be set at 49 per cent next season — down from 57 per cent in the expiring deal — and proposed that it drops to 47 per cent by the end of the six-year deal. This is very hard and I feel terrible about it. "We all kind of feel that's what they are looking for," Pittsburgh Penguins captain Sidney Crosby said of the league after a meeting of more than 275 players in New York this week. "If you look at the key principles of everything, we're showing we're willing to move, to sacrifice things. "If you look at [the NHL] proposal, it's not really the same type of feeling." The last round of negotiations saw the sides cancel an entire season before the NHLPA eventually relented and accepted a salary cap. However, it didn't end up working out so badly for players as the average salary rose to $2.45 million over the course of the CBA. "It actually turned out to be more fair than perhaps it should have been," said Bettman. An 11-day strike in April 1992 caused 30 games to be postponed, while a 103-day lockout in 1994-95 forced the cancellation of 468 games and delayed the season's start until Jan. 20. The 2004 lockout began Sept. 16 and wasn't settled until July 13 — making the NHL the first North American sports league to ever cancel an entire season over a labour dispute. "This is very hard and I feel terrible about it," Bettman said afterwards. "I think we want more of a partnership and it seems like they just want to take money back," said Ottawa Senators forward Jason Spezza. "We did that last time. We gave them a percentage of our salaries and it solved absolutely nothing."